Chicken rezala was brought to Bengal by the Mughal bawarchies from Delhi and Ajodhya. Very rich and superbly tasty, rezala is loved by people all over Bengal and in neighboring states. 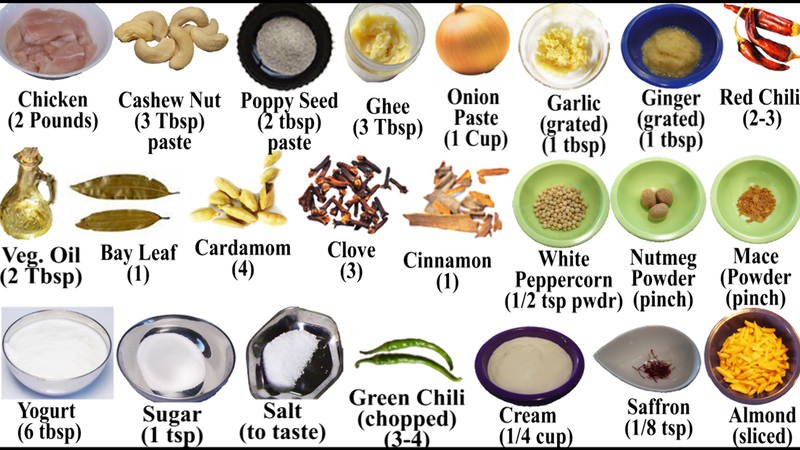 You will need the following ingredients for making Chicken Rezala. Now start frying the other spices. When the ghee is hot, add bay leaf, red chili, clove, cardamom and cinnamon. Fry till it smells of spice (about 1-2 minutes). Continue stirring till the water dries up in about 10-12 minutes. Continue stirring till it turns yellow brown. It may take another 10 minute or so till the raw smell of onion is gone and the aroma of the spices is prominent. Stir to make a smooth mixture. Pick the chicken pieces from the marinade and add to the sautéed spices. Continue stirring the mixture till the oil separates out from the chicken. This process is called kosha in Bengali and it will take about 20 minutes. Chicken will then turn golden yellow. Add the left over marinade. Add about ¾ cup of water. Cover and simmer until the chicken is tender and well done. Check for the seasonings and add if more salt is needed. Serve rezala hot with paratha, rice or chapatti.